Sony Ericsson has taken the veil off its latest smartphone, the Windows Mobile 6.5.3 enabled Aspen. Business phones are 10-a-penny at the moment, so there needs to be some sort of hook to get the crowds exciting. So, not only has SE added the latest version of WinMo on to the device but it is also proudly claiming that the Aspen has a number of green credentials. We first got wind of the Aspen back in January, when it was tentatively titled the 'Faith'. Part of the company's GreenHeart portfolio, the Aspen allows you to charge your phone in the more eco-friendly way with the Energy Saving Mini-Charger EP800. And, well, that's about it for the green side of things – except the panel on the phone is GreenHeart branded and there's some nifty power saving options. If the Aspen doesn't quite bring out the eco-warrior in you, then the phones specs may well appeal. On-board is a 2.4 inch, 240×320 QVGA display, 3.2 megapixel camera, 3.5mm headset jack, front facing QWERTY keyboard, microSD card slot with 4GB card and some stereo speakers. Connectivity wise, you are looking at Quad-band 3G/EDGE, WiFi and Bluetooth. And when it comes to how the device feels in the hand, well Sony Ericsson assures us it has a "human curvature design" so it "fits into the palm of the hand". Always good to know. 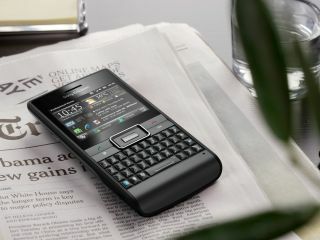 The Sony Ericsson Aspen, which looks likely to take on the Blackberrys and Nokia E72s of the world, comes in Black and White Silver and has a UK release date of Q2 of this year.